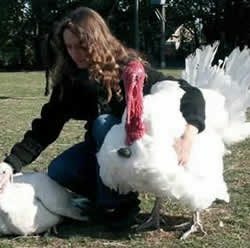 Wendy with pet turkeys Pacco and Rosie. Image via Hillside. Wendy Valentine founded Hillside in 1995 and has rescued horses, cows, pigs and many more animals, including smaller species. Rescue horse Sugar before recovery. Image via Hillside. Hillside was set up as a retreat for animals in need and aims to raise awareness for them. Investigations undertaken by Hillside have made it to the big screen, including on ITV’s Tonight with Trevor McDonald. Alongside this, Wendy’s passion for animals has helped the sanctuary become well-known for its values. Hillside has grown over the years and now provides sanctuary to 1,900 horses, ponies and donkeys. Many more animals live on-site, most of which have been rescued from the farming industry. It offers a permanent place of safety for the residents, who are treated with love and respect. Visitors can stop by Hillside Shire Horse Sanctuary and see the animals in a clean and happy environment. Hillside is a top-rated attraction due to its outstanding animal care. Most people spend around three to four hours enjoying everything there is to see. From stunning animals to an interesting museum, there’s something for all ages. Rescue horse Casper after recovery. Image via Hillside. In June 2017, Hillside even took on an extra 63 cattle after a farmer turned vegetarian. Dedicated staff look after all of the animals and generous donators fund the sanctuary, keeping the animals fed and sheltered. Actor, Martin Shaw, known for his role in The Professionals, is a Hillside patron who supports and helps raise awareness for the sanctuary. True to its animal-friendly values, the on-site café serves delicious vegan food. You can also browse the gift shop and take a souvenir home with you. It’s the perfect escape whatever the weather, as there’s also an indoor area to explore. The sanctuary is open daily from 10 am to 5 pm, from Easter to the last Thursday in October. Entry for adults costs £6 and seniors £5. Children up to 16 cost £4, while children three and under go free. Dogs on leads are welcome. Coaches and cars can park for free. There’s wheelchair access in all areas, including an accessible toilet. Hillside discourages visitors from feeding the animals. Food for the animals can be donated to staff members. Supporters and visitors can find out about any new arrivals through the sanctuary’s Facebook and Twitter pages. Hillside Shire Horse Sanctuary is based in West Runton, Norfolk. Follow the brown signs for ‘Shire Horse Sanctuary’ off the A149 Cromer to Sheringham Road. 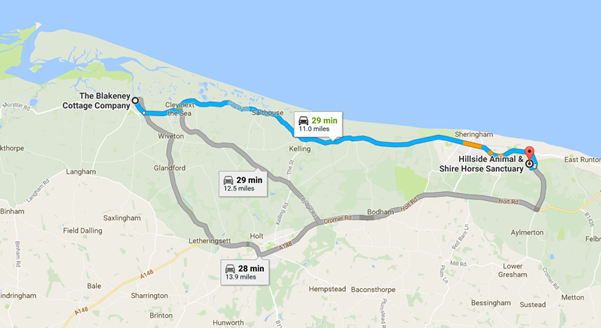 The sanctuary is a half hour drive from The Blakeney Cottage Company HQ.